Electronic cigarettes (e-cigarettes) entered the market labeled as a safe alternative to smoking tobacco, although they do contain nicotine – which is harmful to youth and young adults. These battery-powered devices create a vapor to deliver nicotine and flavorings. E-cigarettes are tobacco products, and have become increasingly popular among middle and high school students. The use of any tobacco product – including e-cigarettes–is unsafe for young people. Like other tobacco products, e-cigarettes contain nicotine. Nicotine is a highly addictive chemical that can be harmful for brain development. The young brain can continue to develop until age 25. E-cigarettes come in many shapes and sizes. 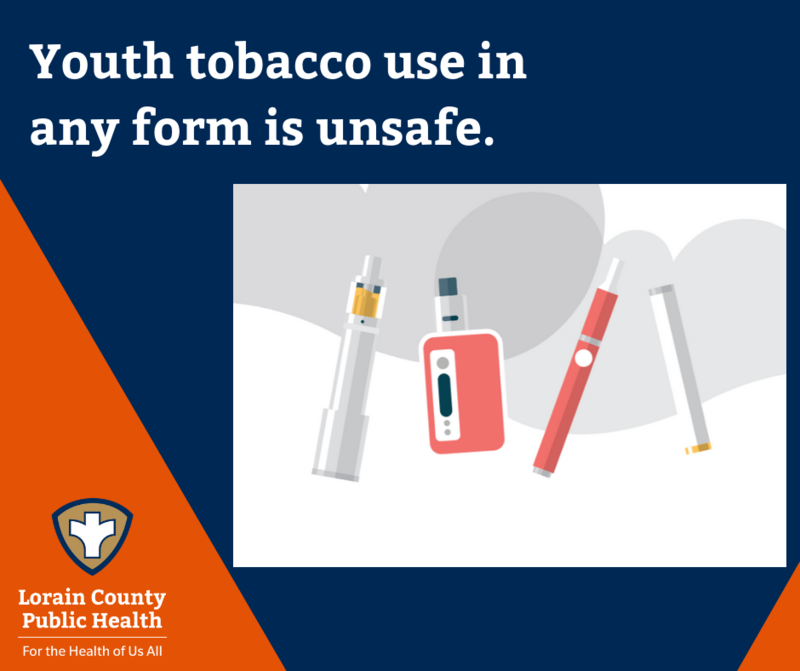 These devices can be shaped like a USB flash drive or a pen – e-cigarettes do not look like traditional tobacco products. One popular brand of e-cigarette includes JUUL; according to the manufacturer, a single JUUL pod contains as much nicotine as a pack of regular cigarettes. According to the U.S. Department of Health and Human Services, tobacco use is the largest preventable cause of death and disease in the United States. Each year, about 480,000 Americans die from tobacco-related illnesses. More than 16 million Americans suffer from at least one disease caused by smoking. Smoking-related illness in the United States costs more than $300 billion each year, including about $170 billion for direct medical care for adults and more than $156 billion in lost productivity. One in every three people who die of heart disease is caused by smoking. Lorain County Public Health reminds you that smoking hurts the heart. In fact, in 2018 the second leading cause of death was heart disease in Lorain County. Smoking increases your risk of heart disease AND it increases the risk of people around you at home or work who breathe secondhand smoke. Find out what steps to take to create a tobacco-free place or community.